WASHINGTON (Reuters) - U.S. President Barack Obama awarded the 2016 Presidential Medal of Freedom - the highest civilian honour in the United States - to 21 key figures at a star-studded ceremony at the White House on Tuesday. 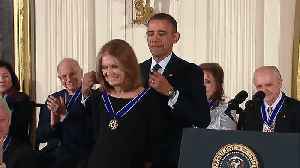 From Diana Ross to Michael Jordan to Tom Hanks, here are the highlights from President Obama's final Presidential Medal of Freedom ceremony. Happy birthday to Gloria Steinem: journalist, activist, feminist icon, and Medal of Freedom recipient under President Obama.